Melissa at The Inspired Room is having another Procrastinator Party. Nice of her to have another one just for me! This week you have to announce your project with Before pics and then you have until the 20th to get it done and post the After results. I really wanted to choose a more exciting project, but I felt that I must choose the project that I truly will keep avoiding unless I am "forced" to finish it. Yeah...it's back. 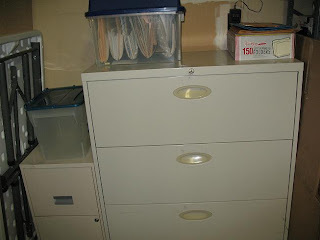 The File Cabinet. I chose the File Cabinet project for the last party and then realized that it was actually a 3-phase project. I successfully finished Phase 1 and this is the After pic. I had grand plans of finishing Phase 2 and Phase 3 during the following month. Um, no. That did not happen. I did take up Phase 2 during my crazy Housecleaning Week, but didn't quite finish it. So here I am...again. My official goal is to finish File Cabinet Phase 2, which is finishing going through the drawers and sorting/organizing everything in the hanging files. I also want to finish Phase 3 which is to set up a system inside my house to handle the paperwork before it goes to the file cabinet. There. Now I'm all official-like. Heh, heh. Have a fabulous day and go start your own procrastinator project! Stop by The Inspired Room to see just how many procrastinators are out there! Oh I loath filing!!! Yes, I said LOATH!! Big filing away some hugs just for you my friend! Good luck completing that project!! I hate filing. But cute file cabinets, I ADORE!! Can't wait to see your afters...in one week. Eh hem.